2013 1:49 PM, originally uploaded by Les Canfield. The Daffodils are in a town in France called Rennes. This town is in the Brittany region in the North West of France. We found the Daffodils whilst wondering through the Central Park of Rennes. On a family holiday. Daffodil, originally uploaded by Miranda Lotte. Photographer Miranda Lotte tells us about this heavenly March 18, 2010 image: I live in Nice on the French Riviera, and this shot was taken in front the Salesian church of Our Lady Auxiliary. 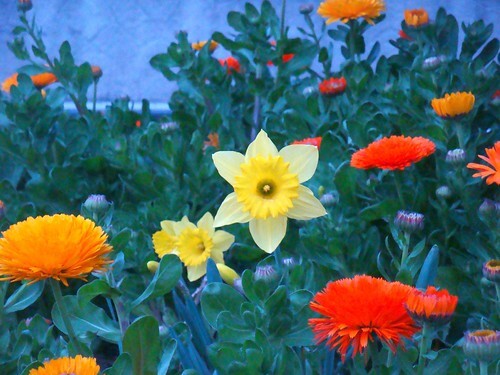 I love daffodils, after the winter, they’re like little suns on the ground. Waves of colors, originally uploaded by La Route. A beautiful garden in Paris! Photographer La Route tells us about this April 4, 2009 image: It was taken in a lovely garden “Le Parc de Bagatelle” in the “Bois de Boulogne” in Paris 10 days ago. 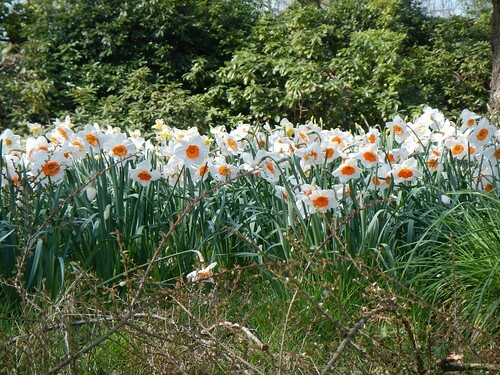 The garden is large, very beautiful with tulips and daffodils planted in the lawns every Spring. It is also famous for its large rose garden. the bicycle and the daffodils, originally uploaded by ANNYIA. 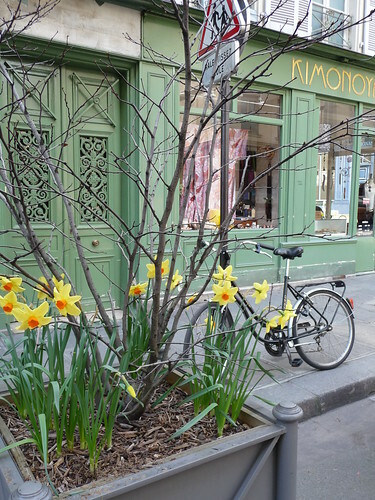 Photographer ANNYIA tells us about this “very springtime” March 15, 2009 image: Situated at the rue du Pont Louis-Philippe Paris 4eme. Plants are planted by the city hall. Daffodil, originally uploaded by fraise. Je ne quitte pas beaucoup ma cuisine ces temps-ci, originally uploaded by el is nice. The photographer el is nice tells us about photographing these cheery daffodils: I took it on January 22, I bought the daffodils in a supermarket : a lot of them were here, talking about spring… Then, I put them on my kitchen window and I like to look at them, behind the glass, among the rain drops…I live very close to Paris : at Ivry-sur-Seine, the weather is not very fine at the moment, rather cold and today, it’s a big strike day, everywhere in France ! Spring is coming …….., originally uploaded by Arnac19. We have daffodils coming up in France! The photographer Arnac19 tells us: They are currently poking through the edge of my rockery bed next to our driveway in Arnac-Pompadour, Correze, France. The garden is still a work in progress, but I was desperate for a bit of cheery spring colour. I planted them in November 2007 and they had their first flowering last spring, but not until March time. They are very early this year, but still have a long way to go until flowering. I’m sorry I can’t tell you what their name is – I just brought a bag of mixed from our local Supermarket when they were on promo, dug a hole, dropped the lot in, and kept my fingers crossed for a colourful display. I was not disappointed. This photo was taken on January 26, 2009.